It’s actually quite simple to make, place your ingredients in a food processor, fill the chicken using a pipping bag, and bake with two slices of cheese. Make a batch and freeze them ready for any meal. 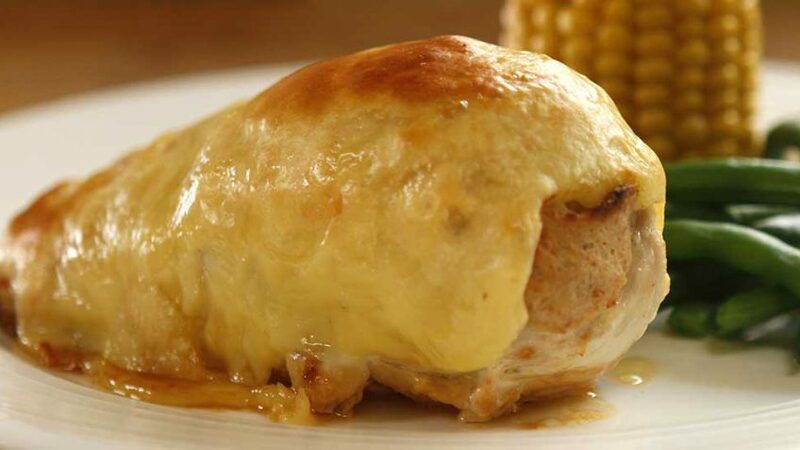 If you like chicken Cordon Bleu, then you will love this version. Better buy some chicken breasts now. Let me know what you think, enjoy! Pocket each breast by inserting a knife parallel to the cutting board on the thicker end of the breast. Push the knife while slightly rotating towards the edge of the breast without piercing it. Remove the chicken tenderloins. Roughly cut the ham and add to food processor. Roughly break up the cheese and add to food processor, along with one whole egg, 1 tsp of mustard, the bread crumbs, the chicken tenderloins and 3 tbsp of butter. Blitz until smooth enough to pipe (Ingredients must all be room temperature or will be too hard). Trim the end off your piping bag and insert the nozzle.Holding with one hand, fold back the edges of the piping bag over your hand and spoon in the mixture. Twist bag to tighten and squeeze until the mixture almost comes out.Insert the nozzle into the slit of each chicken breast and press hard to fill with mixture. The chicken breast should inflate to a plump shape. Add a little salt. In a frying pan on a gentle heat, add two tbsp of butter, place the chicken up side down into the melted butter until caramelised, repeat other side. Place two slices of cheese on each breast and bake for 25 minutes at 320°F – 160°C.